The most efficient numerical methods for the solution of partial differential equations, multigrid methods on adaptively refined grids, imply several drawbacks from the point of view of memory-efficiency on high-performance computer architectures: First, we loose the trivial structure expressed by the simple i,j-indexing of grid points or cells. This effect is even worsened by the usage of hierarchical data and – if implemented in a naive way – leads to both increased storage requirements (neighbourhoodrelations possibly modified difference stencils) and a less efficient data access (worse locality of data and additional data dependencies), in addition. Our approach to overcome this quandary between numerical and hardware-efficiency relies on structured but still highly flexible adaptive grids, the so-called space-partitioning grids, cell-oriented operator evaluations, and the construction of very efficient data structures based on the concept of space-filling curves. 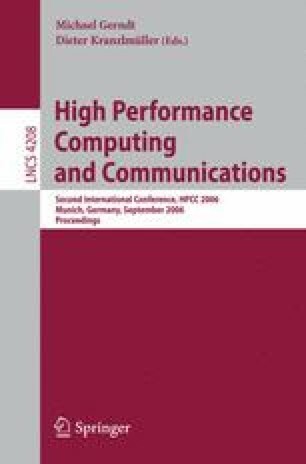 The focus of this paper is in particular on the technical and algorithmical details concerning the interplay between data structures, space-partitioning grids and space-filling curves.